5. Pick the right colour schemeThis bathroom used a gorgeous marble to cover vertical and horizontal surfaces, giving it an elegant, bright appearance. The sheen of marble helps it appear slightly more reflective than wood or simple tiles. To break the monotony of the marble, the shower area is tiled in contrasting blue mosaic tiles. 4. Splash in the blueConfined to the shower enclosure, the blue mosaics contrast against the white-and-grey marble for a luxurious look. 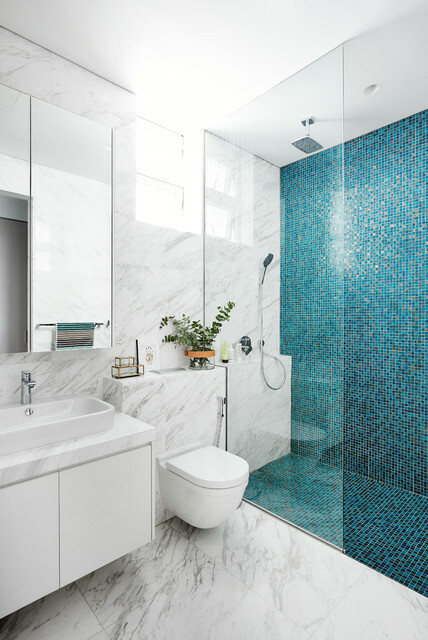 Get the look: This stunning aqua glass mosaic looks amazing in an otherwise neutral bathroom. Ocean inspired modern mosaic tile.